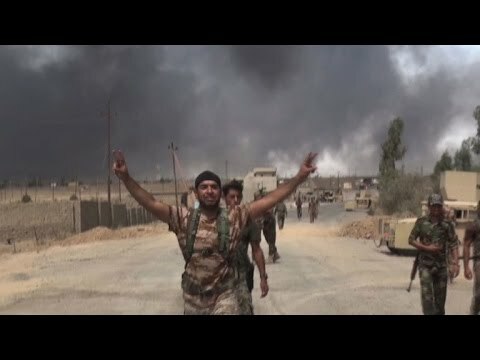 Iraqi military forces have taken the strategic town of al-Qayarah near the major city of Mosul from Daesh (ISIS, ISIL). Mosul is the last major city in the hands of the apocalyptic, brutal cult as it has lost almost all the territory it took in 2014. The counter-terrorism units of the Iraqi army led the charge as they began their assault on al-Qayyarah on Wednesday. Prime Minister Haydar al-Abadi welcomed the victory, calling it an important step toward the liberation of Mosul. He looked forward to the day when Mosul would be rescued from the criminal gangs now terrorizing its population and would be returned to the bosom of the Iraqi nation. The air above al-Qayarah turned black as Daesh saboteurs set fire to its oil wells. Al-Quds al-Arabi reports that in the wake of the Iraqi military’s rapid advance into al-Qayarah and the beginning of the assault on Mosul itself, a source inside Mosul maintains that Daesh fighters took the unusual step of sending hundreds of their family members, as well as widows and orphans of those Daesh guerrillas killed at al-Qayyarah, out of the city with fake i.d.s. Most of these family members made it to al-Raqqa in eastern Syria over secret routes, or to Kirkuk, Salahudddin Province or even slipped in among the refugees headed for the Iraqi capital, Baghdad. Aljazeera reports that as the Mosul campaign gears up there is increasing tension between the Kurdish Peshmerga and the Iraqi army. One source of tension was a communique issued by the Kurdistan Regional Government’s ministry of Peshmerga, which said that the Peshmerga would not obey orders from the Iraqi defense establishment. PM al-Abadi ruffled feathers recently when he said that the Peshmerga would not be permitted to enter Mosul city. Iraqi Kurdistan began with three Kurdish-majority provinces (Iraq had 18 provinces), but in summer of 2014, it unilaterally annexed the more mixed province of Kirkuk, subjecting its Arab and Turkmen populations. Kurdish nationalists have expressed a desire for Mosul, and it is controversial among Arab populations to have Kurdish fighters lead the charge. Meanwhile, Rudaw is reporting that Usama al-Nujayfi, a prominent Mosul politician, is heading to Turkey for consultations at the end of this month. Sunni politicians are restive about their future place in Iraq once Daesh is rolled up as a territorial force.